I have been umming and aahhing about this card and trying to decide whether I like it. I guess you can’t always make things you love. In the end I decided to post it anyway. It is a bit different to my usual style which is probably not so bright and with so much contrast. To make the background I used a paint dabber and a template from The Crafter’s Workshop. I created my basic layout for the card and decided that the stars didn’t stand out enough so I outlined them with a black pen. 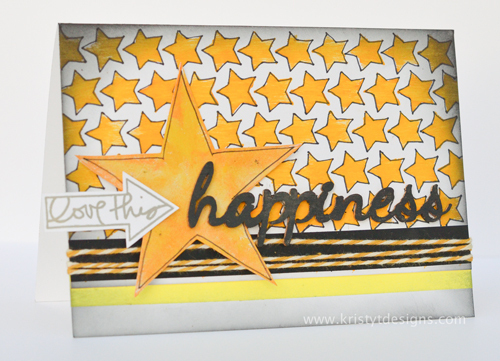 The ‘happiness’ wood veneer is a new one by Prima and was coloured with black paint. 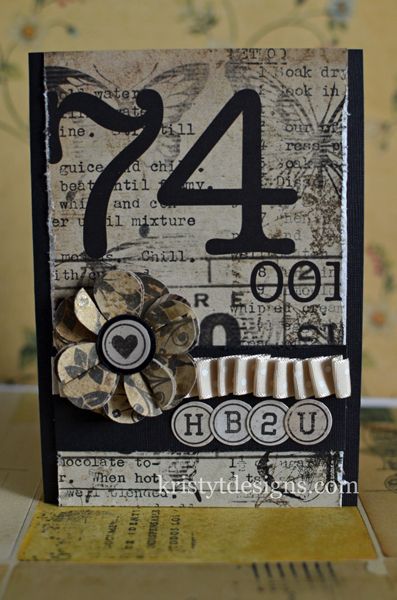 Some twine, a black chalkboard washi tape and star finished off the card. I will be back with a few layouts for Get It Scrapped in the next couple of days. Things have been wet and windy here, so there has been lots of staying inside with a little bit of time for crafting. I love the Vintage Bliss collection by Simple Stories and I had been making a couple of scrapbook layouts using some of the papers. I had some pieces leftover which I used to make this card. I find when I have my things out sometimes I get some inspiration to make a card too and things come together quickly. 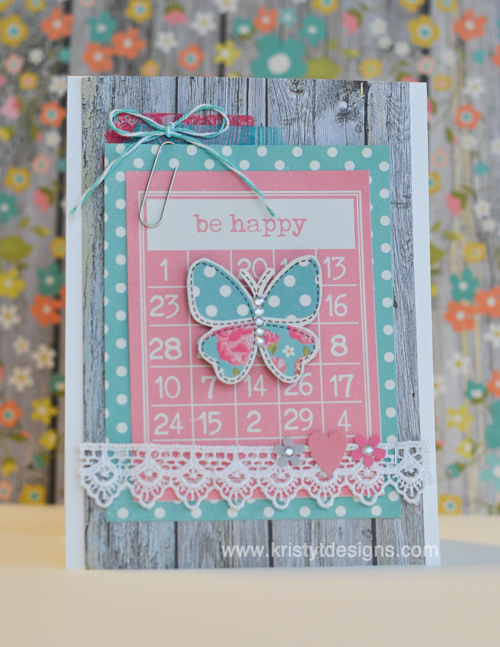 The butterfly had already been fussy cut from the paper so I added some gems and adhered it on top of a bingo card. This was layered with some other patterned papers, some lace, some washi tape, some Vintage bliss stickers, We R Memory Keepers twine and a paper clip. Today’s card features papers from the Indigo Bleu collection kit by Pink Paislee and some direct to stamp colouring using distress markers. The Flamboyant stamp from Penny Black was pretty easy to colour and I did just a little blending of the colours when I coloured onto the stamp. When we went to Melbourne for Technique Overload, Tim Holtz said that you won’t contaminate your markers even if you use a dark colour first. I think you just colour off the darker colour onto a piece of scratch paper. This is a technique that I don’t tend to use that much anymore but making these cards (I made a set of 3) reminded me that the result you get is really lovely. I was able to get a couple of images for each colouring by just re-‘huffing’ onto the stamp but bear in mind they do get lighter each time. If you had the right Christmas stamp it would be a great technique to make a bunch of cards because since there is colour and detail in the focal image, you could keep the rest of the card really simple and still have a striking result. For people not familiar with this technique, you just colour with your markers directly onto your stamp (I have found red rubber stamps tend to work better than clear stamps) and then ‘huff’/breathe onto the stamp (the moisture in your breath re-wets the water based markers) and then you just stamp onto your paper. Another tip from Tim Hotlz was that you can check to see where you have coloured by tipping the stamp in the light and the areas that are shiny are the ones that have been coloured in (so this way you can make sure you don’t miss any areas!). The colouring directly to stamps technique only works with water based markers, ie like the distress markers. It would not work to do this with copic markers although I think there is a different technique using copic markers to get a similar result but I haven’t tried it. Hope you have a great weekend and thanks for stopping by. Supplies: Bazzill card – Java, Distress Markers – Wild Honey, Scattered Straw, Dried Marigold, Spiced Marmalade, Peeled Paint and Forest Moss, Patterned Paper – Indigo Bleu Collection by Pink Paislee, Washi Tape – Bella Boulevard, Twine, Specialty Stamping Paper. 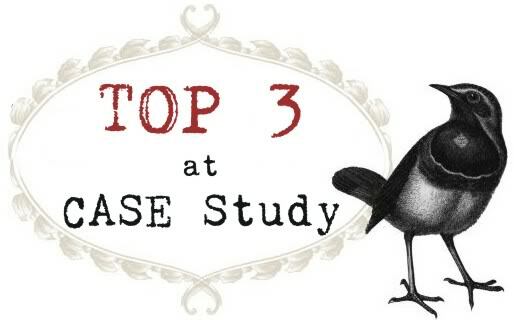 I decided to play along with the CASE Study Challenge #111 this week. The muse for the month of October is Julie Stainton and you can see her card on the CASE Study Challenge blog here. I kept quite a few of the design elements of the card fairly similar but have still ended up with quite a different card. 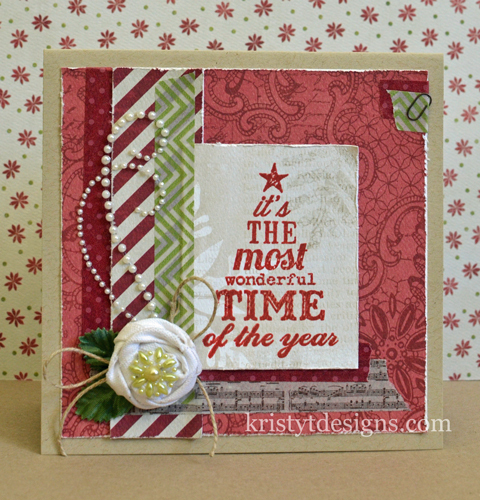 My card for today uses some bits and pieces from the Teresa Collins Christmas Cottage range. 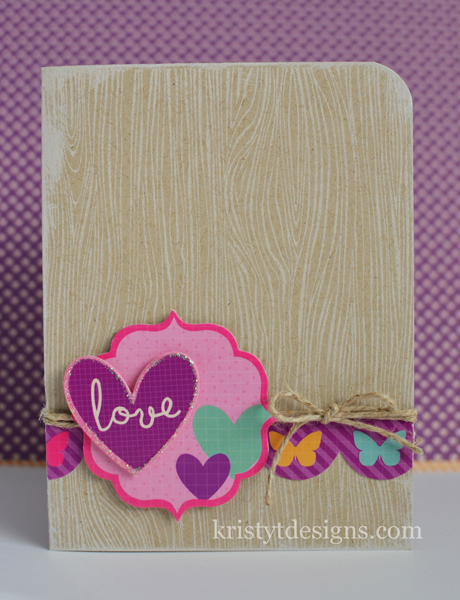 I love the decorative tape that comes as part of this collection – the music pattern, the green chevron and the dots! I always love things with dots. I can see myself using them not just on Christmas cards too. I made the flower using a strip of sticky back canvas. I tied a knot in one end and then rolled and twisted back onto itself so the flower would stick together. I haven’t made a flower out of sticky back canvas like this before and it was really quick and easy so I am sure I will be doing it again. The centre pearls are by Prima. The stamp was stamped onto the patterned paper using Fired Brick Distress Ink, but because the paper has a bit of texture I ended up stamping it twice in the same spot to make sure the the sentiment was even and clear (one of the benefits of clear stamps!). 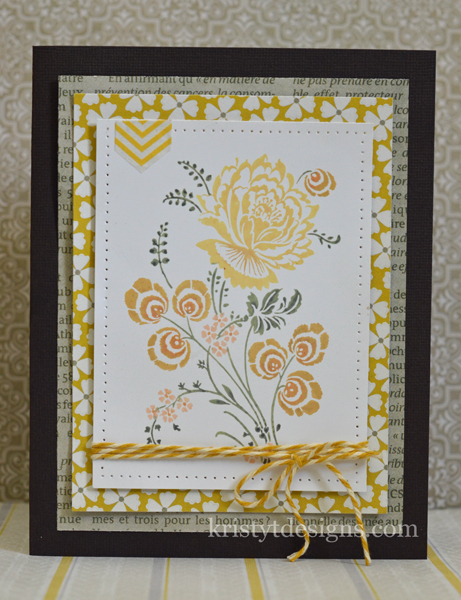 The patterned papers and decorative tape were layered and the card came together fairly quickly which is always nice! I have busy week, with the kids home on school holidays, some home improvements and finalising all the instructions for the projects for next weekend. I am looking forward to it! 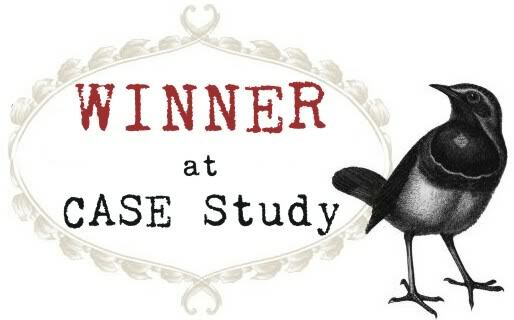 I was also really excited to be named in the Top 3 at CASE Study for last week’s challenge (you can see the CASE Study Challenge Blog here and you can see my entry here or just scroll down). There is a new muse and a new challenge this week and I hoping to get the chance to play along again. Unfortunately today I have spent my card making time watering our brand new lawn (long story but we have got it sorted so I don’t need to hand water again tommorrow and the sprinkler will do the job!) so I haven’t got a new card but have one that I made a while ago. It uses lots of materials from the Kaisercraft Timeless Collection and the flower is made using the Retro Flower punch (I learnt make this flower in a class by Nic Howard). I hope you have a great weekend and I will be back on Monday with a new card.